True Detective, 2014, production still from a TV show on HBO. 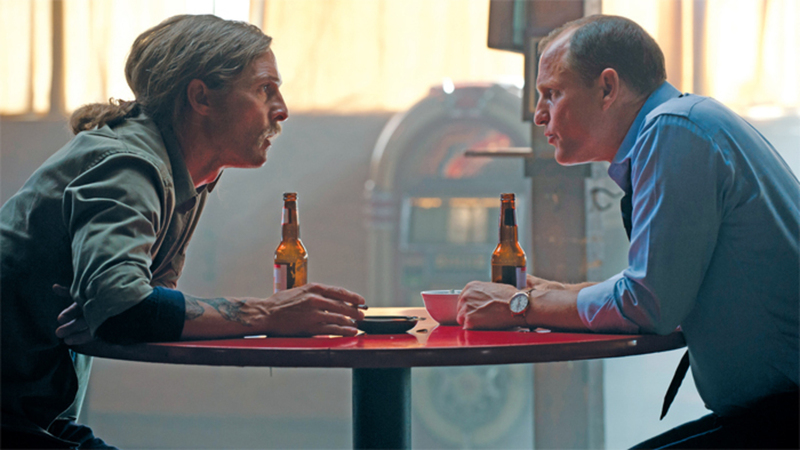 Detective Rust Cohle (Matthew McConaughey) and Detective Marty Hart (Woody Harrelson). Photo: Lacey Terrell. Such skepticismor pessimism, as Cohle terms itgives this character the requisite hyperbolically cool-headed constitution of the hard-boiled detective. (He has earned himself the nickname “Tax Man,” after all, for keeping records of heinous crimes in a dispassionate ledger.) But what makes his attitude resonate for us is the degree to which his pessimism correlates with our anxieties about the sustainability of social institutions and, for that matter, of humanity itself, in a world of increasing temperatures and dwindling natural resourcesa dilemma that undercuts conventional wisdom regarding not only historical progress but also the very idea of history: Time, inseparable from human consciousness, becomes sedentary, geologic, if (as now seems likely) consciousness proves a fleeting cosmic fluke rather than a core element of the universe and fundamental to its program. This fretful perspective is masterfully amplified by True Detective’s title sequencewhich consists of repeated superimpositions of individual characters over a vast landscape, the latter rendering the former increasingly inconsequentialand the show’s dilapidated terrain of social institutions on the wane, from religion (“a language virus that rewrites pathways in the brain [and] dulls critical thinking”) to the ubiquitous petrochemical industry, whose refineries and manufacturing plants provide the series’s contaminated backdrops. If the detective story of Twin Peaks enraptured an earlier generation of television viewers by suggesting that something else dwelt within the forest of signs that was Reaganite Americabut something still tinged with redemptive potentialTrue Detective astonishes for articulating on mainstream television the possibility, on everyone’s mind, that the something of our new century is, in fact, nothing, in its most terrible sense. To say as much is, of course, only to echo the allegorical underpinnings of the detective genre, inadvertently exposed in an oft-recounted anecdote regarding the making of Howard Hawks’s The Big Sleep (1946). In the middle of production, both the film’s director and its screenwriter, William Faulkner, suddenly realized they had no idea whether one of the story’s pivotal characters had been murdered or had committed suicide. So they cabled Raymond Chandler, whose novel they were adapting for the screen. As Chandler would later tell his publisher, with his own sense of bewilderment (and, no doubt, anxiety), “They sent me a wire . . . asking me, and dammit I didn’t know either.” Here the broader implications of the narrative impulse driving the hard-boiled genrewhich is to say, of the tensions that arise via the positing and following of clues on the path toward meaningbecome unusually clear, if only by virtue of the detective story’s inherently baseless character. In other words, however a plot might be resolved within this genre, it is only by virtue of a kind of continual empirical reversal taking place: The story that fits the facts is of less interest, and lesser truth, than the story that creates them. It is the lurking suspicion of this tenuous state of affairsmade so clear by the Hawks anecdotethat prods readers and audiences to grasp, consciously or not, the potentially fictive aspect of their own ways of organizing the world. And this points to the very thing that troubles us most about True Detective. By season’s end, not only has Cohle abandoned all his principlesearly on, he says that in studying photos of murder victims, he came to the realization that, in the end, they welcomed their miserable deaths; yet by the time the final episode fades to black, he has come to see this acceptance in an entirely new light, as embracing the goodness in the worldbut the show itself has set aside its philosophical excurses for the very conventional narrative structures the series’ entire first half strove to dismantle. Perhaps most significant here is the rumor that the series will present a new mystery with a new cast each season, which is apt to create a pulp-fiction atmosphere, the fictive aspect of which will be impossible to ignore. In this regard, if Cohle casts doubt on history, Pizzolatto might yet prove himself a historical materialist, in the sense that appearances may change, but only while internal structures stay the same, such that any story remains only that, and nothing all the more. 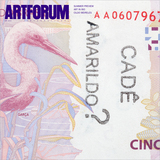 Tim Griffin is executive director and chief curator of The Kitchen in New York and a contributing editor of Artforum.